With a privacy fence, homeowners can enjoy the comfort of their backyards without worrying about nosy onlookers. 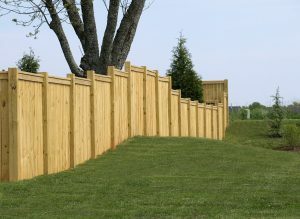 As far as protection is concerned, installing a privacy fence can help in a multitude of ways. Not only can a fence keep your children and pets in, it can also keep pests and intruders out. You can protect your garden from unwanted rabbits or give your dog the freedom to run around the yard without the headache of having to watch them vigilantly. You can rest easy knowing that your children are safe within the boundaries of your yard. Having a privacy fence installed allows you some more creativity in finding the perfect look for your yard. Not only can you paint the fence to match any existing color schemes, but you can also use a fence to hang outdoor lighting or affix decorative objects to. Plus, fences can come in a wide array of materials and styles, varying in materials, style, and security. Privacy fences are specifically designed for lasting for quite a long time and will need only a little bit of maintenance for being in good shape. If there is an unfinished coat then it can be protected with a new coat of varnish and the debris on the surface can be cleaned off with a damp cloth, water and soap. Thus maintaining a privacy fence is not that difficult and time consuming. Loose fasteners can be replaced and tightened when there arises any kind of necessity to do so for ensuring that the privacy fence will remain stable and long lasting. This entry was posted on Friday, September 22nd, 2017 at 2:00 pm. Both comments and pings are currently closed.